I'm a bit behind the times but last months issue about looking for signs was yet again aligned with what was happening in my life. I have two elements of my business and even now that I work for myself, I don't always stop and reconnect with my gut instinct, my inner wise woman to look for the signs that are coming to me. I've for 6 months focused mainly on what I know - the packaging side of my business writing a course for entrepreneurs, SME's, people wanting a refresher, marketing people etc on packaging. It's been hard work. It's one of those things where you start it and then wonder why you did, however its also helped pay the bills, over what had been a difficult few months financially. Technical issues, lack of the correct information was all hindering me, along with my own procrastination about not wanting to do it. Now don't get me wrong there were elements I loved. The section on packaging and the environment and the section on developing a strategy, both link into my values and beliefs and my big picture thinking. But the rest I found tedious. I knew I needed to finish it, I'm not a completer finisher so I decided to ask for a sign of where my future should be focused. Now I see signs a lot and because I already have an affinity to certain objects and creatures - hares, black cats, sun, moon and star art, witches, anything Alice in wonderland. But I couldn't use these as my sign for this big question because I have these images all over my home. I thought long and hard and eventually determined I needed something quite unusual. My question to the universe was "should I focus on my Mojo Academy?". The sign I was looking for was a Kingfisher. Now I don't live near a river so I figured it would show up in a magazine on my computer. I put out the question on a Monday evening before I went to bed a few weeks ago. The next day I woke having forgotten about it and went about my day. I visited my parents and on leaving had this urge to drive to my husband's factory and pick him up from work. (he does a car share so he had a lift into work that day). I sent him a text and told him I was waiting outside. Now one of the reasons I went self-employed was to do spontaneous things like this, but like many I'd got caught up in doing not being. He loved the fact I just turned up. We got in our faithful Landrover Wendy and he grinned at me "are we going to the Lake" he asked. I hadn't really thought much further than picking him up - we could go to the lake to the waterfall, lots of places as his factory is in Mid Wales. So we drove up to Lake Vyrnwy www.lakevyrnwy.com and drove around the lake and I let him decide where we went. We ended up at the back where you can walk up to one of the many waterfalls in the areas, but he said he just wanted to sit by the river. We sat down and he said "shush, this is kingfisher country". The hairs on the back of my neck rose. I'd never considered it. He must have said the word kingfisher about 10 times in the space of a few minutes and then in the distance we saw a flash of colour. Was it a Kingfisher? I can't be sure as it was a blur, but it could have been. In the end I was fit to bursting and told him my question to the Universe, it was like a massive saucepan being banged against my head saying "YES go with the Mojo Academy". Now we've been to that river many times before and we've never ever looked for kingfishers before and it was weird how my husband went on and on about it. We drove around the lake to the far end and saw another flash of colour, I think it was a wagtail, but when they move so fast you can't really determine what colour it was. But it could have been a kingfisher. I went away buzzing, My Mojo Academy had launched and that day was the closing date for the introductory offer. But it made me realise to go with my heart and what feels right. Now I could say it stopped there, but it didn't. I was still focused on finishing my Packaging Academy and the Mojo Academy was being done alongside. Now there has been a big part of me feeling like I should make it more of an intuitive membership. Not just standard coaching, but I wasn't sure. Were people ready for my more "witchy side" . As part of the membership I'd already decided to use some oracle cards to help a-tune the group and on a monthly basis I'd use the more unusual ones. 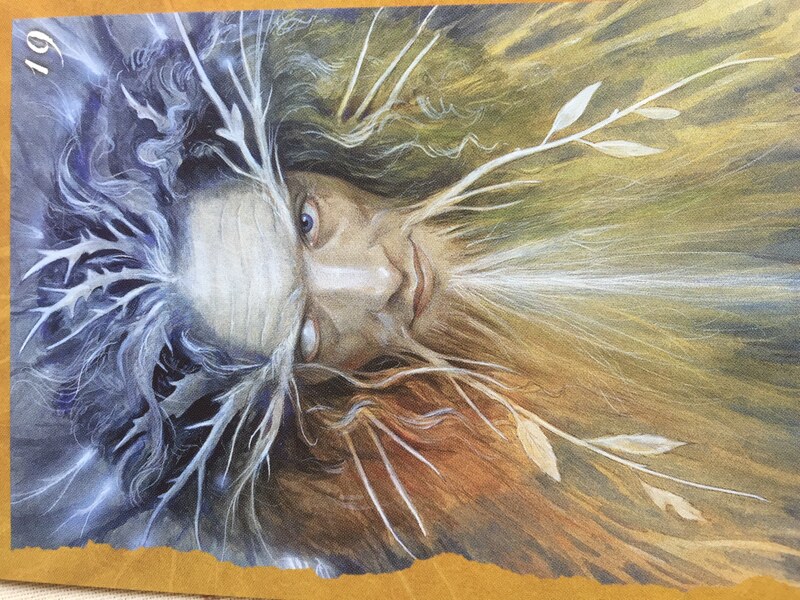 This month I choose the Faerie Oracle by Brian Stroud. The card I picked was the Sage. I drew the card live on Facebook, I read out the short reading. I ended the live video and then read the full version and I couldn't believe what I was reading. It was all about being a guide to others about the inner wiseman (woman) about being the Sage guiding others on their journey. Because we can explore both together, what we class as science now was witchcraft in the past. Many of the books I bought as a teenager about witchcraft, now would be sold as a book of mantras, affirmations and positive thinking. Today I drew the Faerie oracle card the Journeyman - and it felt very apt. I've recently had some packaging consultancy contracts coming through and they will pay the bills, but I've now set my intention, because I've listened and embraced the signs, packaging isn't for me, I want to help as many women as I can and the best way is via the Academy and writing books. 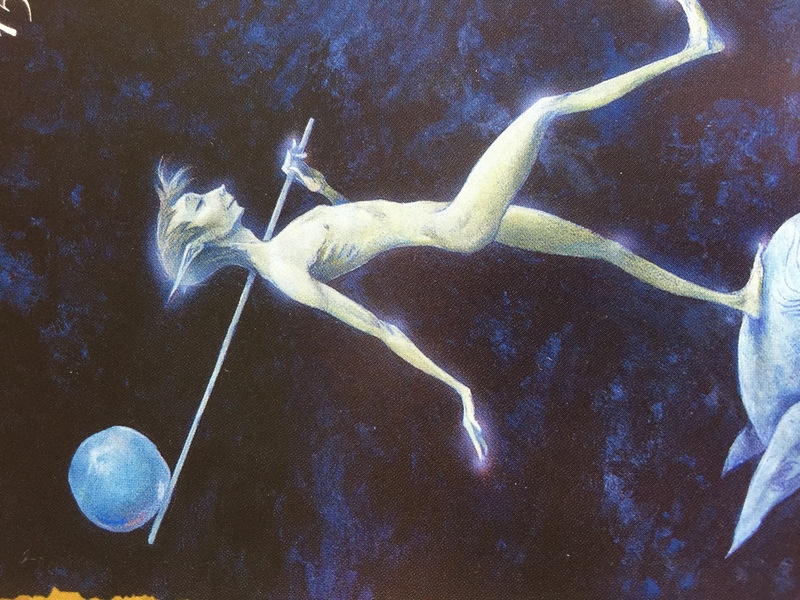 Image of the Journeyman card by Brian Froud. I've set my long term goal and will do what I feel I should have been doing that is guiding women to reconnect with their inner wise-woman to create their own future and bring their dreams to life. So I urge you, do look for the signs, do embrace them and let them guide you to your ultimate vision and to your ultimate life. Psychologies Magazine gives you so many tools to find your way on this amazing journey. Write, journal, sing, meditate, use oracle cards and just be. Look for those signs and fly high. How to stop seeking approval and validation from other people. I reconnect people with wonder, magic and learning so that together we can heal the world. That way we can begin a journey of reconnection with the inner wise woman, only then can you create the life of your dreams. I am a fully qualified NLP (Neuro-Linguistic Programming) Coach, Myers Briggs, Hypnotherapy and Time Line Therapy TM practitioner. I run the Mojo Academy an online community and platform for group coaching for individuals who want to take control of their own journal of re-discovery, self-care and self-development for an affordable monthly membership free. I also run a free commmunity The Mojo Coaching Club to give monthly free hints and tips for women wanting to change their lives. I offer one to one coaching via video call or face to face.